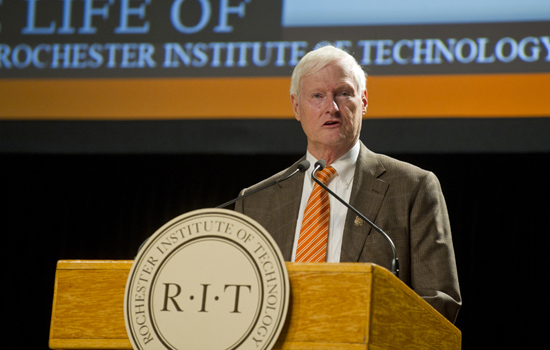 RIT President Bill Destler made his annual Address to the RIT Community on Friday. Applications and enrollment are at record-high levels at Rochester Institute of Technology, more research and private investment is occurring and the near future will bring more opportunities for growth with the Clinical Health Sciences Center, MAGIC Spell Studios and the creation of an advanced manufacturing photonics center in Rochester. Those were some of the highlights presented by RIT President Bill Destler in his annual Address to the Community on Friday. Also speaking were RIT Provost Jeremy Haefner; Academic Senate Chairman Hossein Shahmohamad, professor in the School of Mathematics in the College of Science; Staff Council President Lauren Shields; RIT Student Government President Nick Giordano; and Vice President and Associate Provost for Diversity and Inclusion Kevin McDonald. “The start of another academic year is always an exciting time in the life of a university, and we have much to be proud of as we look ahead to the coming year,” Destler said. He said the freshman class is the biggest, most diverse and most talented ever, and total enrollment is more than 18,500. Students are also enrolling in partnerships RIT plans to launch in China in September. Also on the rise, last year, a record $62 million was received in research grants, with new funds from government, corporate and philanthropic sources exceeding $100 million for the first time in RIT’s history. RIT students last year won National Science Foundation Career Awards, Goldwater Scholarships, Fulbright Awards and top gaming prizes in Microsoft’s U.S. Imagine Cup National Finals. The RIT men’s and women’s hockey teams reached the Elite Eight in NCAA championship competition, and the men’s lacrosse team finished 21-1, the best record in RIT history. President Destler’s complete address is available online.